Over the past few months, I've been testing a few lemon recipes, and now seems the perfect time to share them, since citrus fruit is so plentiful and beautiful in January. 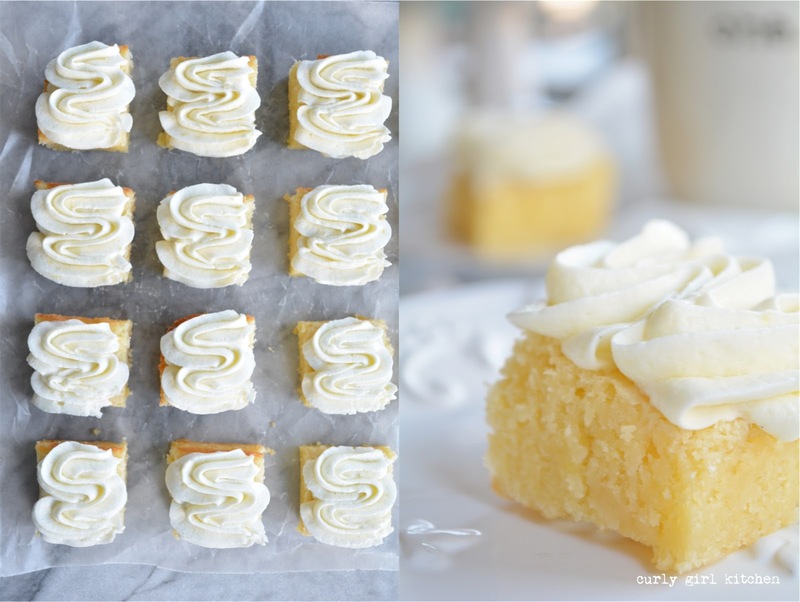 To start, I have a recipe for lemon bars. 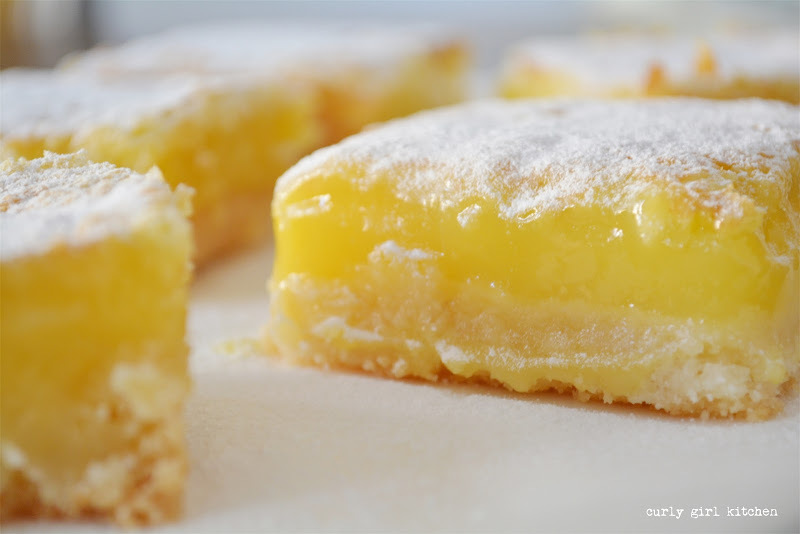 I've made many variations of lemon bars over the years, including a version with a thick cookie crust and a crumble topping sprinkled over the filling, but today's recipe is classic. 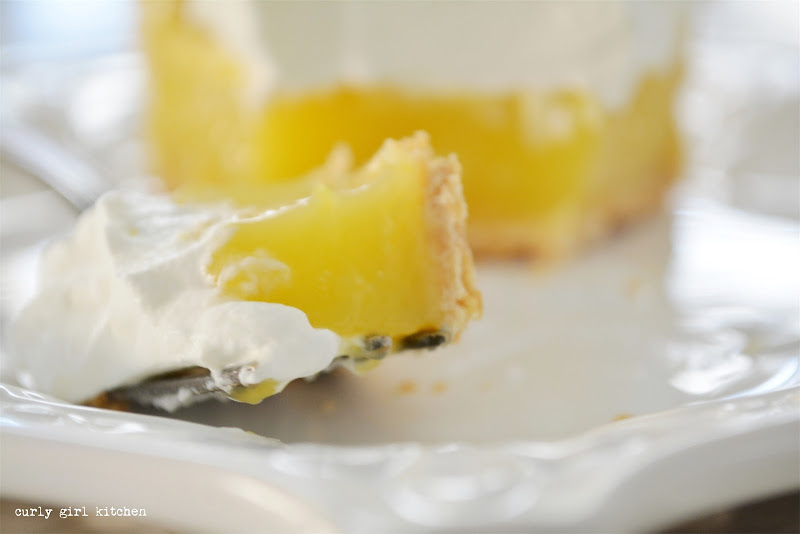 It starts with a short crust, which I've found that I prefer on the thinner side to leave more room for the super tart, bright lemony filling. 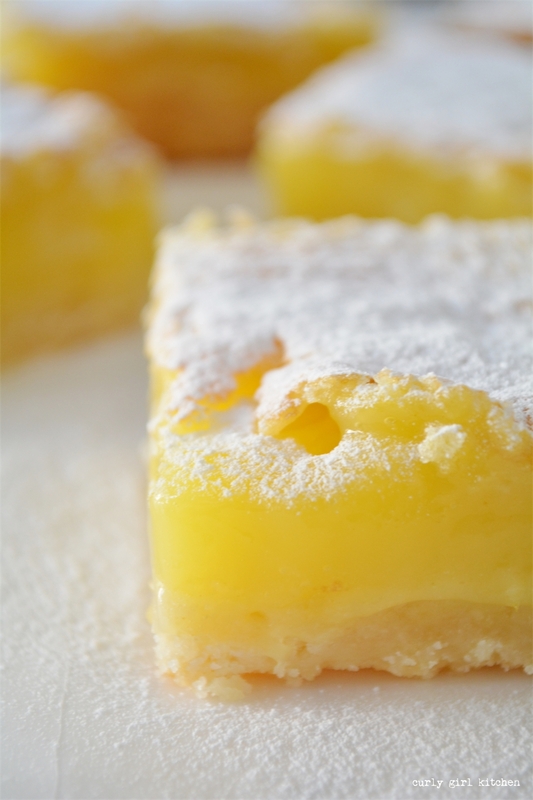 Let me tell you, these lemon bars are addictive. With no dairy in the filling (i.e. butter, sour cream, cream, etc. ), the flavor is pure lemon, fresh and tart and silky. Last year, I also discovered a new ingredient: non-melting powdered sugar. 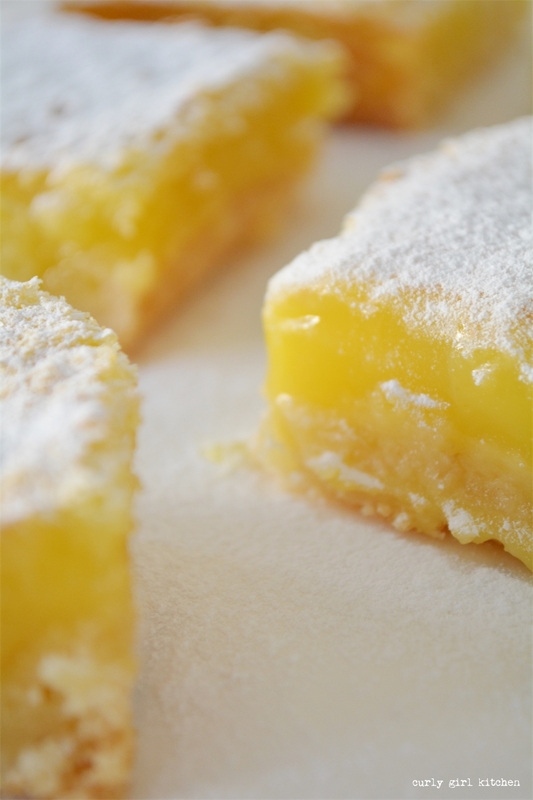 When I sifted it over the lemon bars, I watched as it stayed put exactly where it landed, not disappearing into the filling like regular powdered sugar does, and I wondered, where has this stuff been all my life? 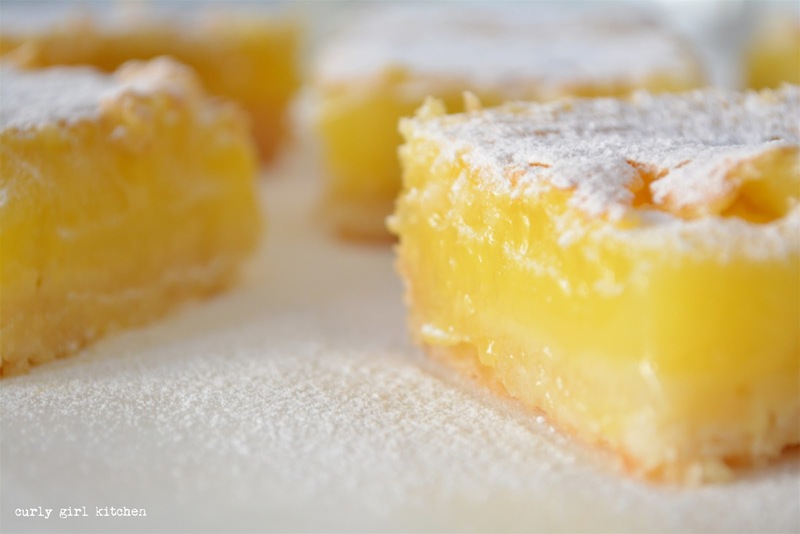 Too many times over the years, I've dusted powdered sugar over a cake or brownies or a lemon tart, only to see it melt into sparse patches even before I could cut the first piece. But this stuff is magic. I ordered a bag on Amazon, and it's going to last me forever since I only use it as a garnish. After the lemon bars came the lemonies, or if you like, lemon brownies. 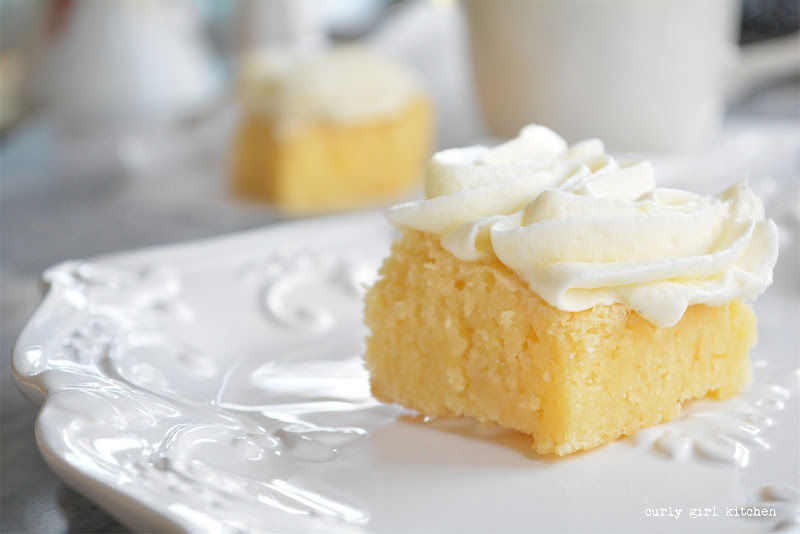 Lemonies are a lemon cookie bar, and it took a few adjustments to this recipe to come up with just the right texture that is perfectly chewy without being too cakey. I love lemon cake, but these are not supposed to be cake bars; they're soft, chewy and moist, dense like a brownie and wonderfully lemony. Also so addictive. 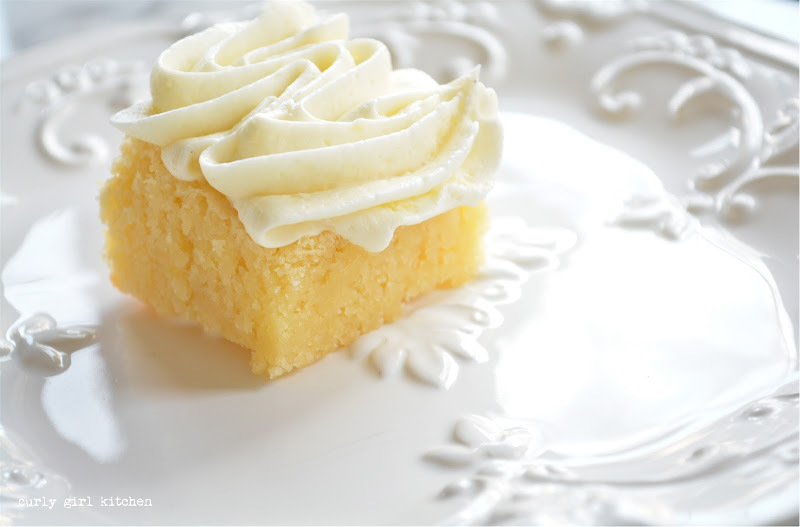 And just as I love a frosted brownie, I thought these lemonies should be frosted as well. Lemon buttercream really enhances the lemony-ness of these cookies, not to mention how pretty it looks piped on in pretty swirls and ruffles. And lastly, the pie. 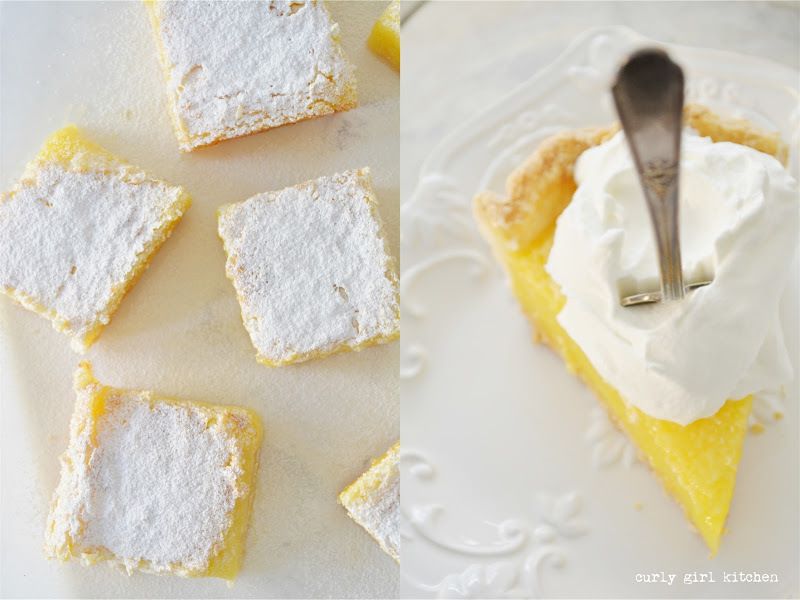 You might be able to tell from the photos, but the filling for this pie is exactly the same filling recipe as for the lemon bars, but baked inside a flaky pastry crust. 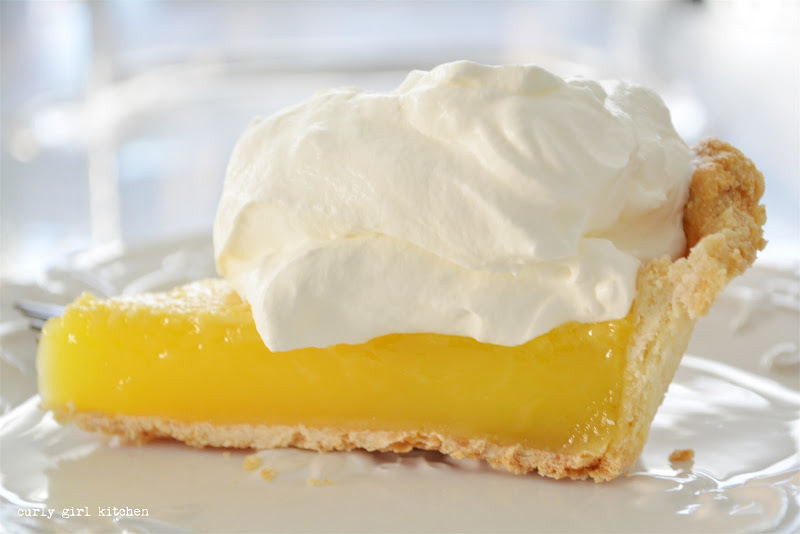 I'm forever making different recipes for lemon pies, and have learned that there is no such thing as a bad lemon pie. Some set up better than others, but they're all good, because, lemon and pie. 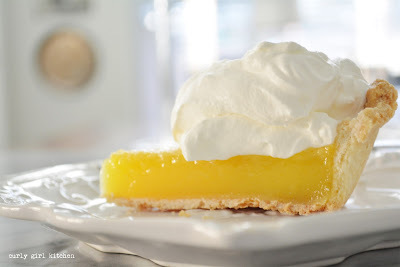 I have a lemon icebox pie that's creamy and almost lemon-custard-like, baked into a salted graham cracker crust. Try it, it's great. 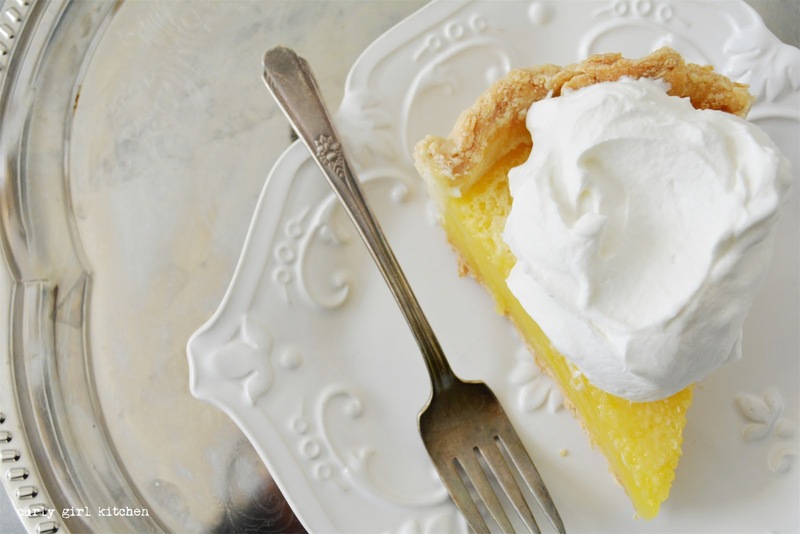 This pie is as bright and lemony as you'd hope for in a lemon pie or tart. The crust is an all-butter pastry crust, rolled thin and pre-baked (also known as blind-baked) until golden brown, since the filling is not baked long enough to cook the crust through without the pre-bake. After chilling to finish setting the filling, top the pie with clouds of freshly whipped cream. It'll be one of the best things you eat this winter. Preheat the oven to 350 and grease a square 8x8 baking dish with non-stick spray. In the same bowl that you mixed the crust, combine the sugar and flour. Whisk in the eggs, lemon juice and lemon zest until smooth. After cooling the crust for 5 minutes, whisk up the filling ingredients again and carefully pour over the warm crust. Bake for 20 minutes, just until the filling is starting to brown a light golden color, but is still wobbly. 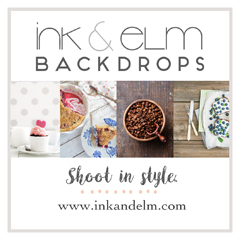 Cool on the counter for one hour, then chill in the refrigerator for several hours until set. 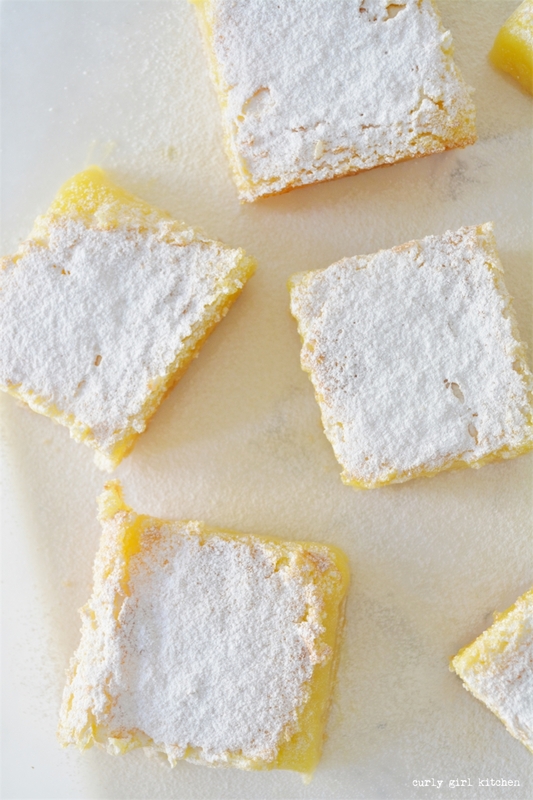 Dust with powdered sugar and cut into squares. 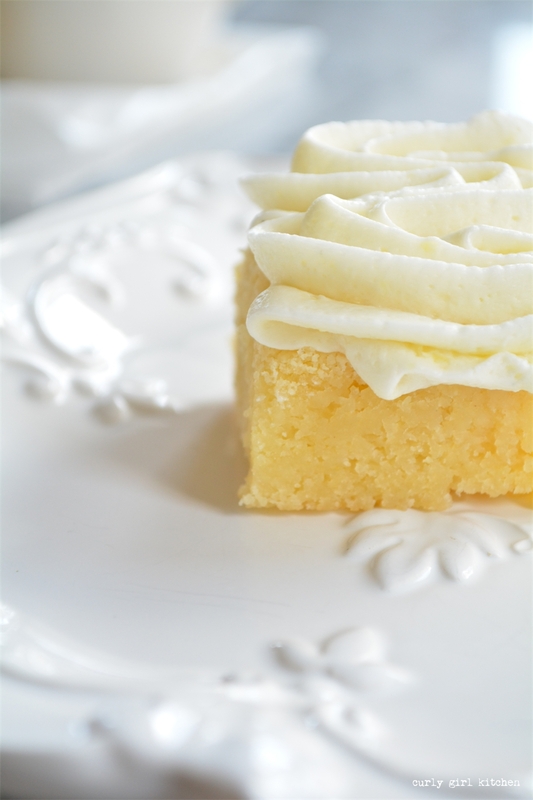 Don't be tempted to add lemon juice to the buttercream frosting, as the acid can cause the butter to curdle. Only add the lemon zest and lemon extract, and thin with a little milk if it's too thick. These would also be great with just a dusting of powdered sugar, or a simple tart glaze made of lemon juice and powdered sugar. Preheat the oven to 350 and spray an 8x8 square baking dish with non-stick spray. In a bowl, whisk together the flour, sugar, salt and baking powder. Add the lemon zest, juice, melted butter, eggs and vanilla, and whisk the batter until smooth. Pour into the pan, smooth out the top, and bake for about 25 minutes, until a toothpick in the center comes out clean. Cool completely in the pan on a wire rack before cutting. 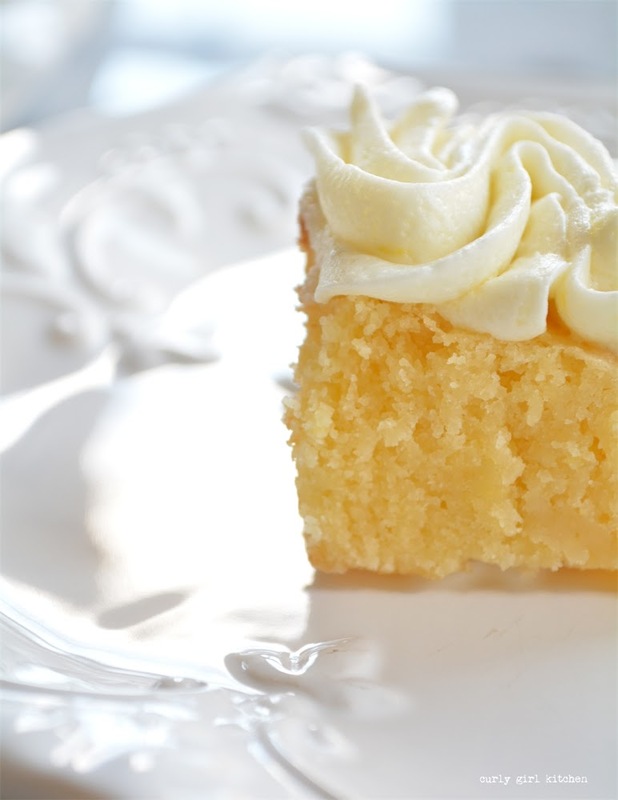 For the frosting, beat the butter, powdered sugar, lemon zest, lemon extract and vanilla on medium speed for 4-5 minutes until very light and fluffy. Frost or pipe onto the cooled lemonies. In a bowl, combine the flour, sugar and salt. Use a pastry cutter to cut the butter in until crumbly, and the pieces of butter are no bigger than peas. Add the milk, then use your hands to work the dough just until it comes together to form a ball. On a floured surface, roll the dough out to between 1/4-1/8 inch thick. Fit the dough into a deep-dish pie pan and trim the edges. Chill in the refrigerator for one hour. While the dough is chilling, preheat the oven to 400. Set a piece of parchment paper (not wax paper) onto the crust, and fill the paper with dried beans or pie weights. Bake for 15 minutes on the middle rack in the oven. Remove from the oven; carefully lift the parchment paper out with the weights and set aside. Use a fork to lightly beat the egg white, then use a pastry brush to brush the egg white over the crust. Return to the oven (without the weights), and bake for another 15 minutes, until golden brown. Set aside to cool slightly. Lower the oven temperature to 325. In the same bowl you used to mix the dough, combine the sugar and flour, then whisk in the eggs, lemon juice and lemon zest. Pour into the slightly cooled crust, then bake for 25-30 minutes, until the filling is a pale golden brown, but still wobbly. Cool at room temperature for one hour, then chill in the refrigerator for several hours, or overnight, until set. 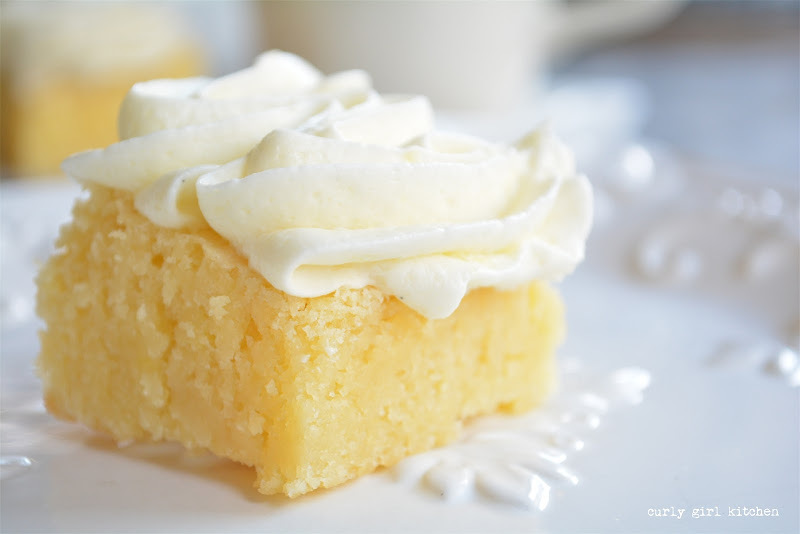 Before serving, pour the whipping cream into a bowl and beat with an electric mixer until soft peaks form. Add the powdered sugar and beat for another minute or two until thick and fluffy. 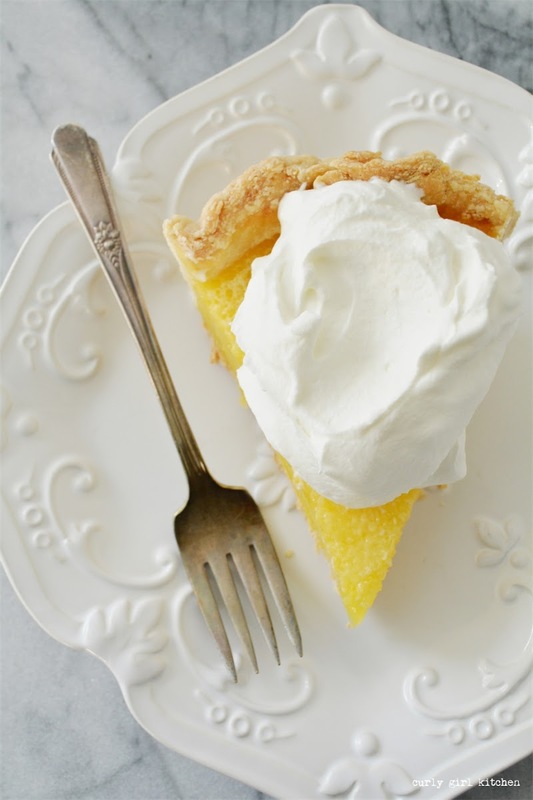 If serving the entire pie at once, spread or pipe the whipped cream over the filling just before serving, or keep the whipped cream in a separate container to serve on individual leftover slices.